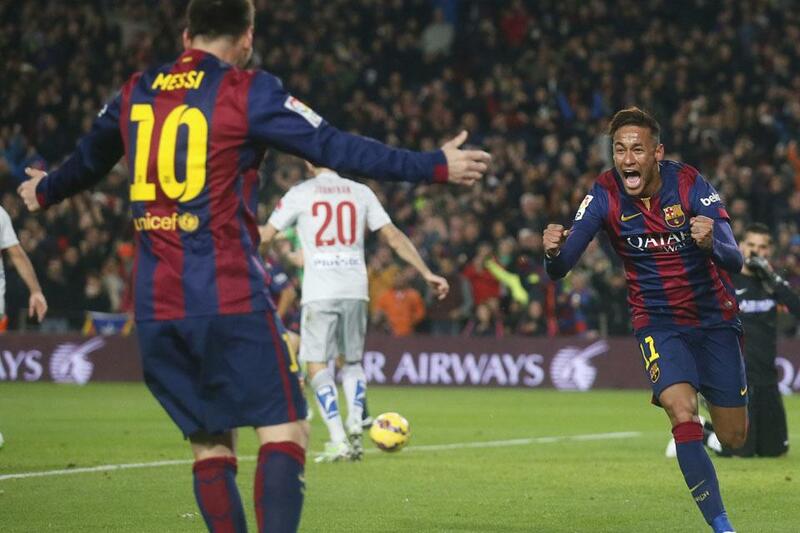 Messi, Neymar and Suarez bagged the goals for Barca. Lionel Messi, Luis Suarez and Neymar were all on target for Barcelona as they ended a week of turmoil by outclassing Atletico Madrid at the Nou Camp. Playing a night before the Ballon d'Or trophy presentation, Lionel Messi was focused and put on a great display, assisting Suarez and initiating Neymar's opener. A physical battle ensued from the outset, with a plethora of big challenges going in time after time. The referee was forced to be doing some serious work throughout. Neymar forced an opener after 11 minutes. Lionel Messi linked up with Dani Alves, before playing it across to Luis Suarez. It came off the Uruguayan towards the path of the young Brazilian who slid it into goal. Luis Suarez got a second less than half-an-hour later. Messi appeared to handle the ball with his arm, but not clear to the referee's attention, he played through the striker who fired away. It could've been a few more, but the resilience of the Spanish champions managed to hold up by the half-time whistle. For the first time in his career, Messi conceded the first penalty of his career, of which Mario Mandzukic fired away to open the game. But with no clearer chances to follow, Messi finally got a goal for himself to cap off his performance as Barcelona triumphed and bought some crucial time. Messi was at the centre of the Luis Enrique controversy, but it was his performance of which has put them back on the right tracks. We had live coverage for the entire contest which you can view below. Live coverage, with play-by-play, analysis, highlights and more for the colossal La Liga clash between Barcelona and Atletico Madrid.